The Rev. Elizabeth Myers began her ministry at Christ Church as Priest in Residence in July of 2018. 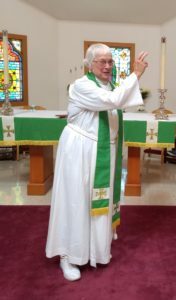 After a first career in school and junior college teaching and administration, Betsy, as she is usually called, was ordained deacon in 1974 and priest in 1977. During her more than forty years in ordained ministry she has served parishes in Virginia, Pennsylvania, Michigan, and New Jersey. Twenty of these years were spent as rector of the Episcopal Church in Milford, Pennsylvania. In addition she spent a sabbatical serving as a priest in the Anglican Church in South Africa and much of two years early in her retirement with the Episcopal Church in Navajoland in Arizona and New Mexico. She now makes her home in Hackettstown where she continues to enjoy part-time interim type ministries and opportunities for supply ministry.